Let me brief Joomla 4 new features in an infographic, which you can share with others to help spread the Joomla 4 news. There are many new features added in Joomla 4, Let’s do feature comparison between Joomla 4 and Joomla 3. .
JoomlArt team have researched and got you most wanted FAQs about Joomla 4. We will keep posting new questions and answers frequently. In this blog post, we will discuss on the new features and improvements that would be available in Joomla 4 stable release. Hidden menu item allows admin to create page that will be published and menu item not shows on frontend. In this blog post, we will discuss how we can create hidden menu items in Joomla. This tutorials provide useful tutorials / tips for Joomla users from basic to advanced. This tutorial will show you step-by-step instructions to remove index.php from URLs for your Joomla 4 websites. There are different types of fields Used in Joomla like Calendar, colour, editor etc. In this blog post, we will discuss the types of custom fields in Joomla 4. One of an important feature in Joomla 4 is creating an override for Joomla modules, component and layouts through Joomla back-end panel. Joomla 4 editor gives a Safe and Fast method to Edit your template files and copies the template files. In Joomla to edit with help of this option, you can add and edit template files easily. This blog post will go indeep in the new feature: Joomla 4 media manager – how it works, how it is improved and new features built-in. The new version of Joomla 4 is following WCAG 2.0 guideline to implement the accessibility support. Now people who have accessibility problems can configure the Joomla menu, extensions and components very fast and easy. Google Analytics plays an important role for the website owners to know about the websites pages pageviews, bounce rate, session. It will give an accurate state of the pages and also help to track the data. If you’re a passionate Joomla! user reading every possible news about upcoming Joomla! 4, there are high chances you seen something called "Orthogonal Component Structure". Joomla 4 is a big hit for Joomla community, the major release version will integrate Bootstrap 4 - the most popular framework to build responsive, mobile-first web projects. To test the new Joomla version, please do installation of Joomla 4 alpha 2 on localhost following the Joomla 4 installation tutorial. Joomla 3.8 introduced a feature for routing system – that is used to include id of article, users, contacts … in urls. This feature is also maintained in Joomla 4 for better SEO in Joomla. 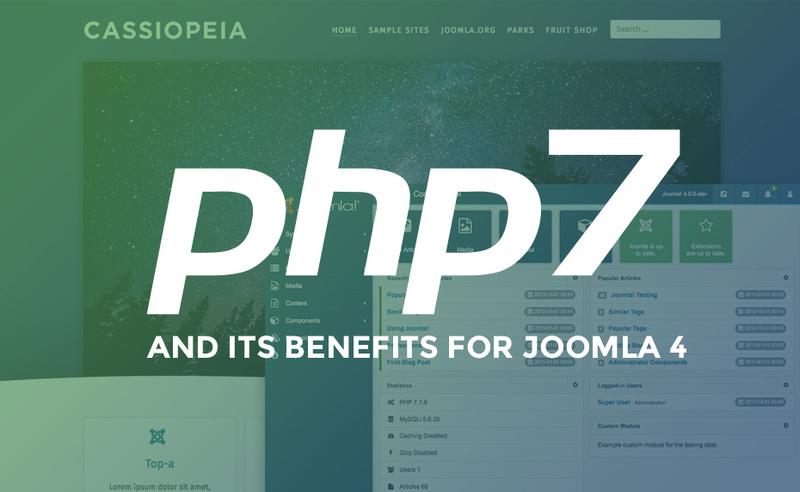 Joomla 4 and PHP7: what are the benifits? PHP 7 is the latest version of extremely popular programming language used for developing websites and online applications. It is estimated that over 80% of websites relies on some version of PHP, fully or to some extent. Joomla 4 comes with new front-end template – cassiopeia with more flexible layout system, bootstrap 4 integration, optimized codebase, new web technologies and more.